Recent advances in the application of cryogels in the synthesis and processing of inorganic as well as carbon-based materials are briefly summarized. 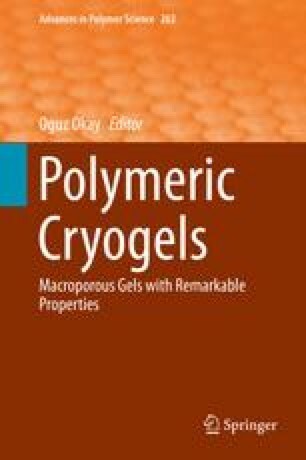 Synthesis of complex oxides by using polymeric cryogels causes a substantial reduction in phase formation temperature and thus promotes a significant decrease in grain size. Freeze-drying of co-precipitated gels and residues prevents the agglomeration of nanocrystallites usually observed during atmospheric drying. This feature is also widely used for the isolation of nanoparticles prepared by various wet chemical methods. Ceramic materials with oriented tubular pores and mesoporous pore walls can be obtained by using directed crystallization of ice from ceramic slurries. Carbon cryogels with a specific surface area of up to 2,000 m2 g−1 can be prepared by thermal processing of the corresponding polymeric precursors. Cryogel-derived composites of carbon nanotubes and graphene-based materials with various oxides demonstrate outstanding mechanical properties and enhanced electrical conductivity. Partial support by the Russian Foundation for Basic Research (grant 12-08-01241a) is gratefully acknowledged.